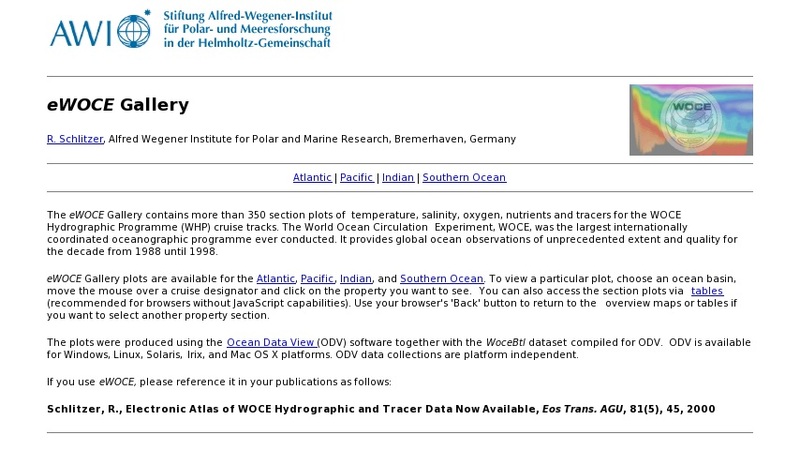 This site from The World Ocean Circulation Experiment contains more than 350 section plots of temperature, salinity, oxygen, nutrients and tracers for the WOCE Hydrographic Programme (WHP) cruise tracks. It provides global ocean observations for the Atlantic, Pacific, Indian, and Southern Oceans. To view a particular plot, choose an ocean basin, move the mouse over a cruise designator and click on the property you want to see. You can also access the section plots via tables.